The London-based philosopher, priest and journalist, the Rev. Dr Giles Fraser gave four challenging and tantalising addresses at this year’s Cork, Cloyne and Ross Clergy Conference last week at Ballylickey. Giles, a columnist with The Guardian, who famously resigned as a Canon of St Paul’s Cathedral, London at this time last year in the wake of the Church’s response to ‘Occupy London’, opted for a topical subject: finance and economics. His wide-ranging and gripping addresses were on the subjects of Christianity and money, theological reflections on economics and the current crisis, thoughts about Occupy, as well as on the role of the Church in modern society generally. 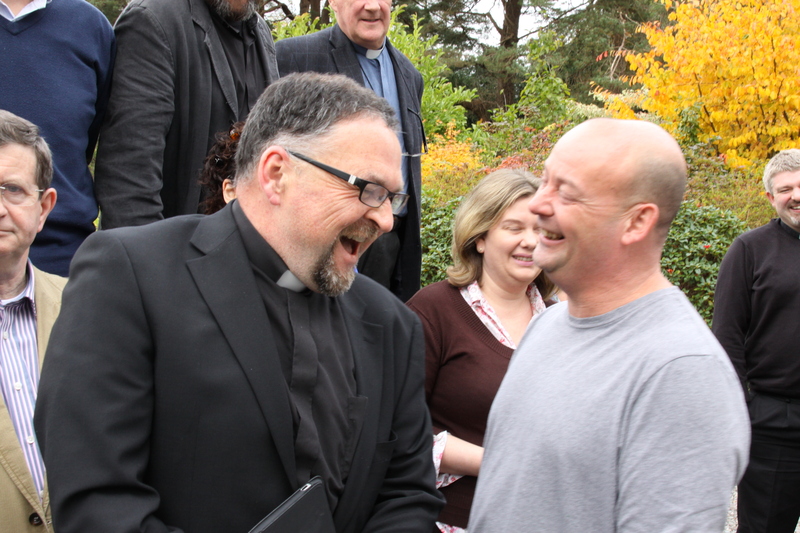 Canon Paul Willoughby (left), local rector, shares a joke with the speaker at the 2012 CCR Clergy Conference in Ballylickey, the Reverend Dr Giles Fraser. This entry was posted in Clergy Conference, Community Involvement, Contemporary Issues, Diocese. Bookmark the permalink.